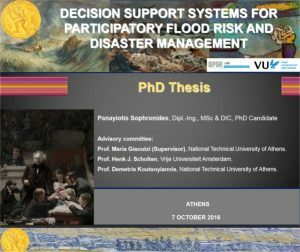 On October 7, our SPINlab-colleague Panayiotis Sophronides has successfully defended his PhD dissertation at the National Technical University of Athens. His thesis is entitled ‘Decision Support Systems for Participatory Flood Risk and Disaster Management’ and purports to critically review the existing knowledge and to identify and propose innovative solutions towards improving situational awareness for better supporting decisions for flood risk and disaster management. Panayiotis has worked together wit Prof. Henk Scholten and Dr. John Steenbruggen at the SPINlab on the Research theme Risk management. We congratulate him with his successful defense and wish him all the best with the next steps in his career!